This 17 day adventure holiday in Egypt and Jordan provides access to some of the world's most fascinating ancient wonders with guided sightseeing and cultural interaction allowing small groups to meet Nubian families and come face to face with the Great Pyramids and the carved city of Petra. Plenty of free time to explore under your own steam adds to an excellent itinerary that also includes nights on the Nile on a traditional felucca boat and a Bedouin desert camp in the folds of Wadi Rum. The archaeological sites of Egypt and Jordan have long drawn travellers from far and wide, and as this adventure holiday also includes overnight train journeys and opportunities to snorkel in the Red Sea and float in the Dead Sea, there's bound to be just as much natural excitement as cultural enlightenment. Follow a local expert as they lead you into the tombs of the Pharaohs and along the banks of the River Nile as you travel from Cairo to Amman on an absolutely legendary small group adventure. This company has operated on responsible tourism values since its inception. From an environmental perspective, our initiatives extend from our company offices to our tours. A local green energy provider powers our head office and stores; we encourage cleaner transportation methods for staff; and purchase all supplies from a local green business supplier. Our office is as paperless as possible and our brochures use 100% PEFC certified sustainable paper. Supporting communities is and always has been at the heart of our tours. We provide business opportunities to local people by employing local guides and tour operators. The majority of accommodation used on our tours are small-scale, locally-owned hotels. Our tours mainly use public transportation wherever possible and are small in size to keep our impact on fragile sites and communities as minimal as possible. We monitor the sustainability of our tours through traveller evaluations and through feedback from our tour leaders in order to allow for continuous improvement. We support the local economy and business initiatives by visiting local shops, restaurants, and markets on our tours. Many tours incorporate community projects as a way of supplementing community income and supporting community development projects. In 2003 we founded a non-profit organisation as a way for our travellers and our company to give back to the people and places we visit. We develop community projects around the world in the areas of health, education, small business development and environmental conservation. Funds are raised through traveller donations and fundraising. The company pays all administration fees which means that 100% of each individual donation goes directly to the community projects. Each year, we continue to support and develop new partnerships with more community projects and community-based tourism initiatives worldwide, in Latin America, Asia and Africa. On many tours, you have the option to visit a project as part of your trip. The accommodation used on a trip can make the difference between local people receiving many benefits or none at all. It can also mean huge impacts or minimal impacts on the environment. On this some of our nights are spent sleeping in more unique and economical accommodations. First is the sleeper train. Accommodation on the sleeper train is in comfortable twin-share bunk-bed compartments. The beds convert into seats when not in use and luggage is stored under the bottom bunk. The sleeper train doubles as both an overnight accommodation and a method of transportation as well instead of traveling by plane, which not only saves money, but leaves minimal environmental impact, and we always try to use transport that creates fewer emissions. The second unique accommodation on this trip is the Felucca. Feluccas are very basic traditional Nile sailboats and make for an extremely relaxing and enjoyable way to travel down the river. You sleep on the deck of the boat that has mattresses and blankets that are provided. This style of accommodation provides business to locals who operate Feluccas while providing us with a truly one of a kind experience. The third is camping! Camping is a very low-impact style of accommodation because the structures are temporary! Camping means little to no electricity consumption, low water consumption and definitely no energy sucking air conditioning! Camping in the desert of Wadi Rum in Jordan is truly an adventure. We sleep on beds in one long goathair tent, which is divided by blankets into twin-share “rooms” for privacy. You will be able to get off the beaten track to get a first-hand experience of the beautiful desert. Just remember we will be taking everything with us that we brought to the area, and using reusable items so as to create little to no waste. Your Tour Leader will explain a little about how to be environmentally responsible when living outdoors in the desert! Egypt has lots of options for getting around making less of an impact. We always try to use transport that creates fewer emissions. 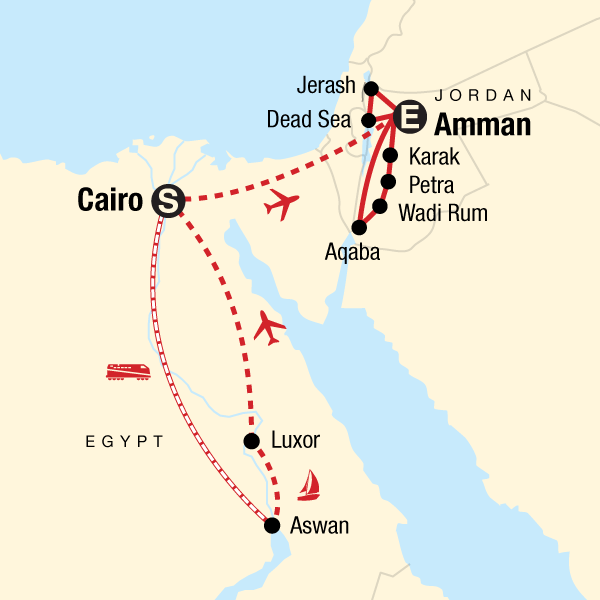 We will ride the sleeper train, camels also known as “Egyptian Mercedes”, a felucca, donkeys, and walking, only taking private transport when needed. Getting around as the locals do not only allows you to experience the culture on a deeper level, but the same way it is at home, using alternative methods of transportation is the most sustainable way to go! On this trip you’ll even have the chance to ride a camel to the peak of Mt. Sinai. Those who dare can take the 3750 stairs up by foot. Pyramids of Giza. While once located in remote desert, they now touch the suburbs of modern Cairo. No matter how many photos or documentaries you have seen, your first glimpse of these marvels of the ancient world will take your breath away. As a qualified Egyptologist, your tour leader is able to expertly explain the facts and myths behind these three mammoth works of art. You will also visit the mysterious Sphinx with its lion’s body and man’s face. Time permitting there might be the chance to see inside one of the two smaller pyramids, take a ride around the pyramids on camel back or visit the fascinating Solar Boat Museum with displays on one of the pharaoh’s funerary barges - it may just be the oldest boat in existence! Luxor has often been called the world’s greatest open-air museum, and for good reason: the number and preservation of the monuments in the Luxor area are unparalleled anywhere in the world. Walk through history today, past statues with the heads of gods and animals, beneath pillars carved with lotus buds and papyrus, and still vibrant hieroglyphic relics. Ride in a horse-drawn carriage, sail in a felucca or take a sunset cruise. The city of Luxor has the most concentrated temple, tomb and monument region in Egypt. Included among these is the tomb of King Tutankhamen, located in the Valley of the Kings. Cruise the Nile on a traditional Felucca. We cruise on a Felucca to explore this area of the Nile from the water. Crossing to the West Bank, we’ll board our camels for a short hour-long ride to view the ruined sixth century monastery of St. Simeon. All meals are provided by our Nubian crew. Dinner in a local home. In Aswan we visit a Nubian village, where we'll take a walk around the community with our local guide before enjoying a traditional dinner at a local home. It is a chance to learn about this culture up close, and provide an opportunity for a family to earn income from tourism through sharing their culture. Meet the Bedouins of Wadi Rum. We camp in the desert as the nomadic Bedouin people share their culture and stories over a dinner cooked in traditional fashion, with the meat and vegetables cooked in an underground oven.